Lamar Mechanical Engineering Professor Xuejun Fan has been distinguished as an Institute of Electrical Engineers (IEEE) Fellow. Dr. Fan is one of one-tenth of one percent of the number of IEEE members globally elevated to the distinction of Fellow in a year. The recognition is one of the most prestigious honors IEEE bestows upon a very limited number of senior IEEE members who have contributed significantly to the advancement or application of engineering, science and technology bringing meaningful value to society. Dr. Fan pioneered work in moisture related reliability of the semi-conductor computer microchip. Fan led a team at Intel to identify the root cause of a moisture problem with an Intel ultra-thin stacked-die chip scale package. He eventually provided several solutions to address moisture related stress buildup and implemented them in the manufacturing process. He received several awards for his work, and his paper about the work and solution won “Best Paper Award of IEEE CPMT Transactions” in 2009. 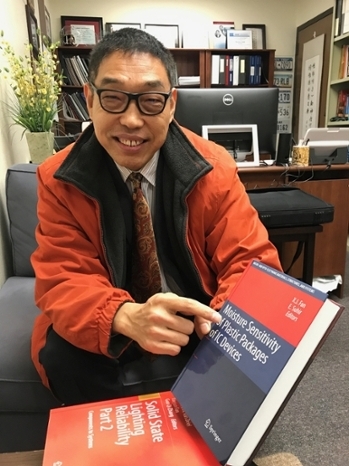 He then wrote a book about his work, “Moisture Sensitivity of Plastic Packages of IC Devices.” The book has been downloaded more than 30,000 times since its publication in 2011. Since his initial work to ensure the reliability of the microchip, Dr. Fan has gone on to develop an accelerated luminous flux depreciation test method for LED systems, which has reduced the testing time from 6,000 hours to 2,000 hours. His accelerated test was the first of its kind in the LED industry and has created a significant impact to product development cycle time and cost. Fan published a book titled "LED Reliability: from Components to Systems," which has been downloaded 35,000 since publication in 2012. In 2017, the new book “LED Reliability Part 2” was published to include Fan’s most recent contributions since the first book. “Dr. Fan is more than deserving of this distinction,” said Dr. Victor Zaloom, interim dean of the College of Engineering. “He crossed disciplines from mechanical to electrical engineering to make significant contributions to the semi-conductor computer chip impacting everyday life from cell phones to heart monitors,” said Dr. Victor Zaloom.